Open House at Palatka Airport - - PAGE 400. Open House at Palatka Airport · · PAGE 400. January 30, 2016: The Palatka Airport is having an open house and fly-in today and the weather is good as you can see below. The Saint John's River is always visible when I depart Rockledge heading anywhere north or west. The departure is to the north remaining clear of the Orlando Class B airspace before turning direct for Palatka. The course is now heading northwest to the Palatka Airport just past the Saint Johns River and before the heavy haze. Here a map segment showing the northern part of today's flights. This American Aviation AA-1A was parked next to me. The pilot is a doctor who uses this airplane as his "putt-putt" fun flyer. His bigger airplane is a Piper PA28-161 Warrior with four seats and the same size engine that I have in my RV-9A. I took this photo as I was heading down to the big hangar to get barbecue for lunch. I did not take many photos on the ground. This Stewart 51 kit is a P-51 replica S-51D with a Chevy V-8 engine and geared prop up front. YES! It is quite FAST! You can look up the FAA registration number to learn more about this airplane. The actual registration number is N510JP. This airplane is based at Spruce Creek airport. The little yellow airplane in the background is a Mooney Mini-Mite. The Daytona International Speedway is very active at this time of the year. The KDAB airport does not allow any touch-and-go landings when the race track is full of race fans. 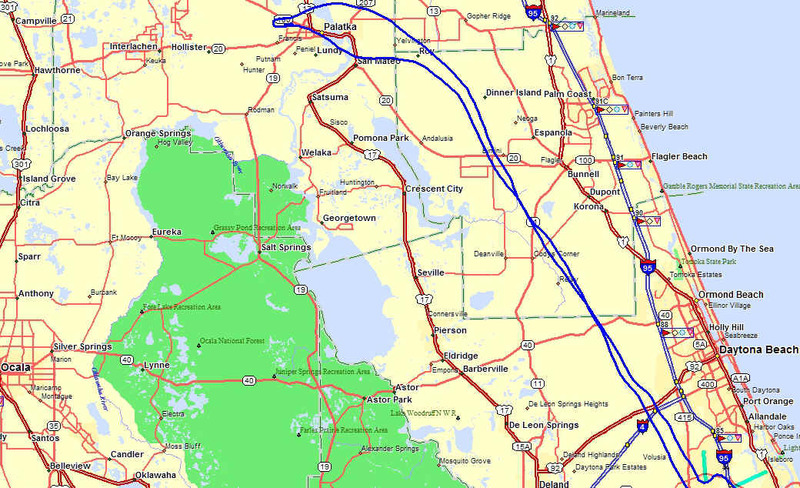 The Spruce Creek Airport and aviation community is near Port Orange, Florida located south of the Daytona Beach area. The shadow of my vertical stabilizer/rudder and my communications antenna are visible on my left wing in this banked turn. This is the map segment for the area of the photo above and the next two photos below. 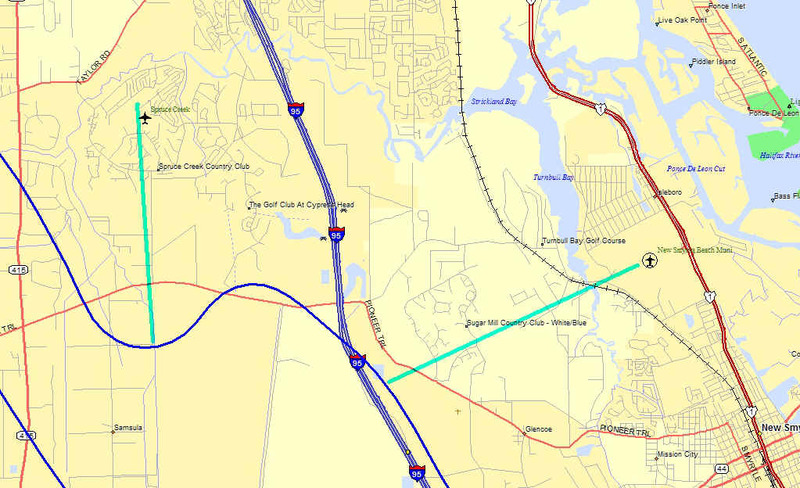 The GREEN lines are about 3 miles long showing my distance from the Spruce Creek Airport and from the New Smyrna Beach Airport when I took the photos. This next photo shows the whole Daytona Beach area on the barrier island with the Atlantic Ocean beyond. The New Smyrna Beach Airport (KEVB) is located adjacent to US 1 as seen here from three miles west of the airport. That is Ponce Inlet interrupting the barrier islands. I have been showing the area between Daytona and Melbourne a lot in recent flights, so let's cut to the end on the ramp at Rockledge. Add another 2.1 hours to the Hobbs meter today.